There's also a concert series at Busch Gardens, a gem and jewelry show and a dog show in Brooksville. 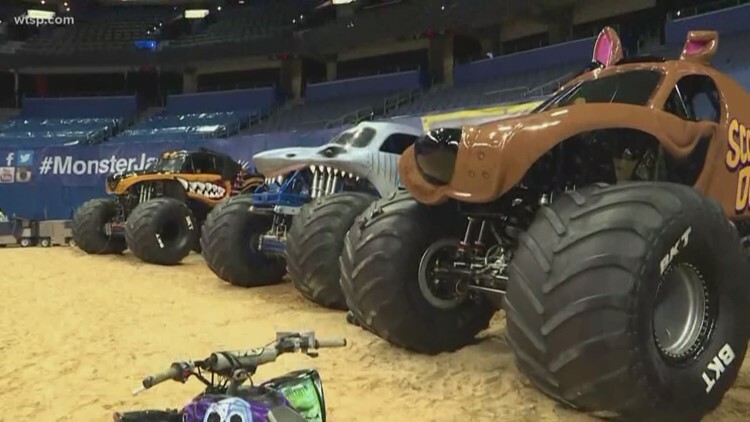 Massive monster trucks roar into Raymond James Stadium on Saturday. You can come early to tailgate and take pictures with the towering trucks and drivers. The Party in the Pits is 2:30-5:30 p.m. before the 7 p.m. show. Tickets are $15-$185. 4201 N. Dale Mabry Highway, Tampa. Busch Gardens’ long-running concert series returns with music spanning from the 1950s to today. Saturday you see Cirque Vertigo featuring the Wallenda Duo. The duo will return March 11-16. Up next is ARRIVAL, an ABBA cover band from Sweden, Herman’s Hermits starring Peter Noone, The Diamonds, ballroom dancing troupes and more. Performances are included with park admission, though priority seating is available for purchase. Runs through March 16. Show times are 11:30 a.m. and 1:30 p.m. Monday through Saturday. Saturday night, watch the Tampa Bay Lightning face off against the Buffalo Sabres on a giant screen on the beach. Guy Harvey Outpost at Tradewinds Beach Resort hosts the watch party with the Lightning street team and cheerleaders. There will also be games, giveaways and food and drinks for purchase. Coolers are not allowed, but you can bring your own beach chairs, umbrellas and towels. The puck drops at 7 p.m.
Every weekend, Pro Karting Experience opens up its track to little drivers wanting to take their kid-sized vehicles for a spin. Vehicles allowed are those for ages 2-6 or Power Wheel-size drivers. There’s a $5 pit pass per driver and a $20 pass for Power Wheel rental and pit pass. Parents are responsible for drivers and their behavior. The northern Pinellas city hosts its first film festival this weekend at seven locations around Dunedin. Saturday brings a panel on women in film and television at Blur Night Club, then a The Walking Dead discussion with the show’s director of photography at Soggy Bottom Brewery. Tickets $10-$25; $45 for weekend passes. The weekly market held Fridays and Saturdays in Dunedin’s Pioneer Park hosts more than 50 vendors selling local wares. The family-friendly and dog-friendly event features local produce, raw honey, baked goods, plants and local arts and crafts. The comedian and actors is on at 7: 30 p.m. and 10 p.m. Saturday at the Improv Comedy Theater. Tickets $35. Looking for doggos this weekend? Florida Classic Park in Brooksville hosts the Florida Gulf Coast Cluster through Jan. 20. The event features AKC recognized breeds from Tampa Bay kennel clubs in Florida’s version of the Westminster dog show. Specialty shows include agility trials, junior showmanship, obedience trials and a puppy competition. Free for spectators. $5 for parking. Shop for hundreds of cut gems, hand-crafted jewelry, collectible beads and rocks. It runs 10 a.m. Friday and Saturday and noon Sunday at the Central Park Performing Arts Center. 105 Central Park Drive, Largo. The Orlando theme park hosts a whole weekend of races with more than 100,000 athletes and spectators. One of Central Florida’s largest sporting events features 5K, 10K, half marathon, marathon, runDisney Kids Races and the runDisney Health and Fitness Expo. Even if you’re not running, there’s a little something for everyone to enjoy during the marathon weekend.